More than 35 years after the release of its low-budget, outrageous, and audacious first installment in 1981, The Evil Dead is still alive. With four movies and a TV series under its banner, the Evil Dead franchise has rightly earned a reputation as the little horror series that could. 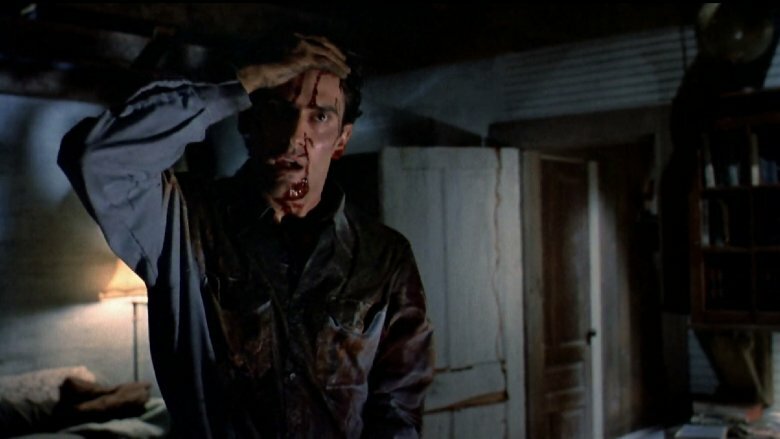 From its DIY beginnings at the hands of a few aspiring filmmakers to its serialized tenure on Starz, here's how the crazy, campy, chainsaw-happy Evil Dead went from the backwoods of Michigan to the delirious nightmares of horror fans worldwide. The Evil Dead was willed into existence by one essential trio: director Sam Raimi, actor Bruce Campbell, and producer Robert Tapert, though none of the three had those titles when they came together to start their project. They were instead, in the words of Bruce Campbell, "three schmoes in search of a clue." Unbeknownst to all of them, they were destined for a long future together, and it all started with a series of low-budget Super 8 films they made together in college with a loose collective of friends making up their cast and crew. "I wanted to be a filmmaker," Raimi said, according to Campbell, writing in his memoir, If Chins Could Kill. "but I thought that it wasn't going to be possible. I just thought I would run from reality as long as possible until they dragged me back to my dad's store." After cobbling together a catalog of shorts, the three started thinking about producing a full-fledged feature. Slowly, they turned the crazy idea into a crazy thing they were actually doing, and in 1979, Raimi came up with a story about some kids who accidentally summon evil spirits from a sacred burial ground. To make their horror project, which they wanted to name The Book of the Dead, the trio first finished a short film as a proof of concept, calling it Within the Woods. With a budget of $1,600, they brought in a familiar crew of actors from their Super 8 productions, shooting the half-hour movie over the course of a three-day weekend. They stretched every dollar for the production, using duct tape, shoe polish, Halloween costumes, and canned cherry cobbler for blood and gore. Armed with a completed prototype, the filmmakers set out to find investors, setting their budget at a seemingly out-of-reach $150,000. A friend put them in touch with a film distributor, who provided a letter of intent to distribute their movie—provided they actually finished one. For critical bona fides, they convinced a Detroit theater to screen Within the Woods, attracting a crucial writeup in the Detroit News. "It was the first, best and perhaps most important review we've ever gotten," wrote Campbell. "Nothing felt better than to slap that review on the desk of a potential investor and casually ask, 'Read the paper today?'" Their pitch prepared, the filmmakers started courting investors. Not knowing anything about how to raise money, they decided to try everything, starting with their family, then friends, then local businesspeople, at one point screening Within the Woods in the soap aisle of a local supermarket to secure funding from the store's owners. One investor came from a chance meeting Raimi had at a Kmart Photo Processing counter. "[One] impediment to raising money was credibility," wrote Campbell. "Three guys with no professional experience, questionable education, and a dream to make a film in Detroit wouldn't exactly make the average investor dive into his pocketbook." To make up for their lack of credibility, they staged what Campbell estimated were hundreds of screenings of Within the Woods, picking up a dollar here and there, eventually coming up with $85,000 after months of work—not nearly enough to work on the movie to completion, but enough, they felt, to get started. Throughout the production process, the money ran out, necessitating more begging from investors, then putting up property as collateral—their own, and that of their very trusting family members. "A phrase we began to hear a lot was, 'Guys, no more means no more,'" Campbell later wrote. Knowing money was tight, the trio was merciless when it came to keeping costs contained. Actors made $100 a week, production assistants made $50 a week, and Tapert, Raimi and Campbell set aside $35 a week for themselves as executive producers—money they never collected. "I recall attempting to buy a pack of gum during the shoot," wrote Campbell, "and realizing that I simply had no money to pay for it." In the absence of money to throw around, the team got clever, using anything and everything available to work movie magic. One night, Raimi woke to the sound of the wind shrieking through his window; he brought the sound man in to record it, and used the noise in the movie. To create shots of the camera breaking through windows, the filmmakers just shoved the camera through a real window, affixing a 2x4 and a bar to the camera to break the glass before the lens touched it. "When all else failed," wrote Campbell, "we just taped the damn camera to Sam's hand. The opening shot of Evil Dead consisted of me pushing Sam in a rubber raft across a swamp while he leaned out, skimming the camera across the water and swooping over decaying branches. Lest you forget, the number one rule of the B [movie] jungle is: 'When in doubt—make it up as you go along.'" 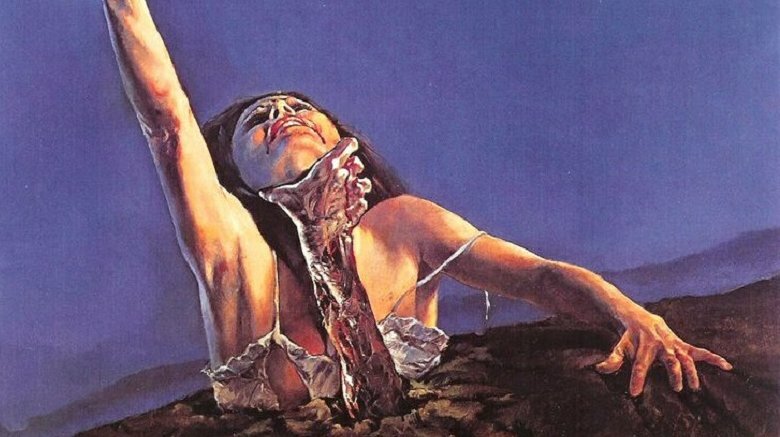 The Evil Dead wasn't shot with safety first in mind, and the cast and crew went through all manner of painful indignities to bring the film to life. A disclaimer in the actors' contracts, according to Campbell, told the performers that "you will also be the guinea pigs for makeup testing. These heinous products have not been tested on animals, because they will be tested on you…"
To play the possessed dead, the actors needed to wear large glass contact lenses, uncomfortable blinding contraptions that could only be left in for 15 minutes at a time. One actress lost her eyelashes making a plaster mold of her face; others were mercilessly scratched up by branches in the woods; the Karo corn syrup that the crew used for blood invited mosquitoes; and in the cold December nights of their 12-week shoot, equipment would actually freeze. At one point, Campbell's shirt was so soaked in syrup that it basically turned into candy, with the sleeve snapping clean off when he tried to put it on. In another instance, Campbell sprained his ankle while running down a hill after Raimi forced the actor's pain into his performance by hitting his bruise with a stick before takes. Instead of being scared away by the painful difficulties of production, the crew leaned into the challenge. "I like it when an actor bleeds," Rob Tapert exclaimed at one point. "It makes me feel like I got my money's worth." The filmmakers showed The Evil Dead to anyone in the industry they could wrangle. Producer Irvin Shapiro, who would ultimately act as a sales agent for the crew, reacted to the movie with an all-timer of a quote, saying "It ain't Gone with the Wind, but I think we can make some money with it." He also suggested changing the name from Book of the Dead to something snappier, and Evil Dead was born. The movie needed a distributor, and finding one ended up being just as much of a DIY project as the film itself. They needed an abundance of marketing materials—domestic and foreign posters for the movie, a trailer, and the technical tools to allow foreign distributors to record dialogue in a different language. "Even if your film was marketable, you couldn't close a deal without these items," wrote Campbell. "And if you couldn't close, you couldn't collect money to pay back the investors." They started cobbling together their materials, using behind-the-scenes photography to make as many different posters as they could. For promotional swag, they printed their movie title on matchbooks, commissioned custom T-shirts and hats, hand-pressed buttons, and folded hundreds of brochures. "This all seemed like a lot of work at the time," admitted Campbell, "but it wasn't until years later that we realized how good we had it." Working this way, they had complete control over their product, and doing all the work meant they'd reap all of the reward—a showbiz rarity. An "overnight success" is rarely as simple as it sounds, with years of work going unappreciated before the floodgates open and all the hard work pays off. This was the situation the Evil Dead producers found themselves in as the movie rolled out, and reviews started rolling in. 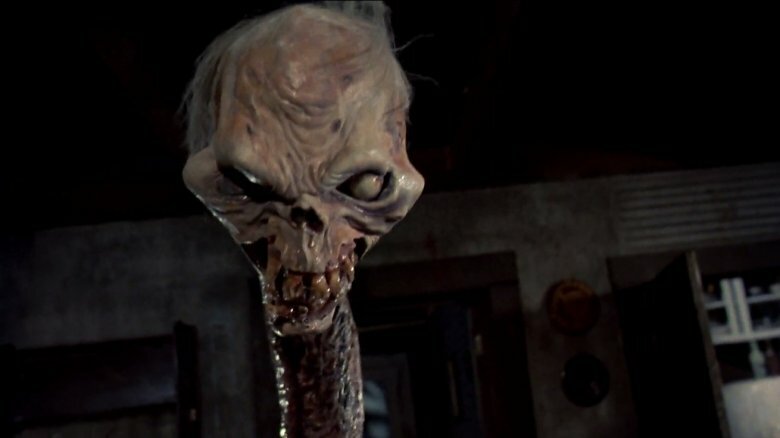 The movie became a sensation thanks to some well-timed support from horror author Stephen King, who wrote a review for the movie in Twilight Zone magazine in which he called it "the most ferociously original horror film of the year." The filmmakers eagerly capitalized on this, getting permission to use the quote on every advertisement they could. Campbell can't overstate how important this was for their success, calling King's endorsement "a protective force field around our little film" that prompted a wave of other reviews. One of the best notices came from the L.A. Times, which went so far as to call The Evil Dead "an instant classic." The movie sold in territory after territory before premiering, and word-of-mouth appeal kept it going as a robust video release after its theatrical run. The Book of the Dead was finally written, and Evil Dead lived. Six years after putting their faith in the Michigan schmoes, the film's investors got their money back. When Raimi's second feature, Crimewave, failed to make a dent at the box office, the new-to-showbiz Evil Dead trio decided to circle the wagons and produce a sequel to their first feature. Not wanting to get run out of Hollywood, the trio trekked back into the woods. A bigger budget and the backing of a studio didn't alter the filmmakers' DIY ways. Most effects were made cleverly, and there was no shortage of suffering on the set this time around, either, though a lot of the burden fell on one unfortunate performer: the director's brother, Ted Raimi. Outfitted with a foam body suit, Ted took on the role of a villainous, horrific witch, and Raimi was so hot inside the suit that his body produced a constant stream of sweat. "In the finished film, look closely as Ted spots my character and bellows fiercely," wrote Campbell. "You'll see a stream of sweat pouring out a slit in the makeup around his ear." 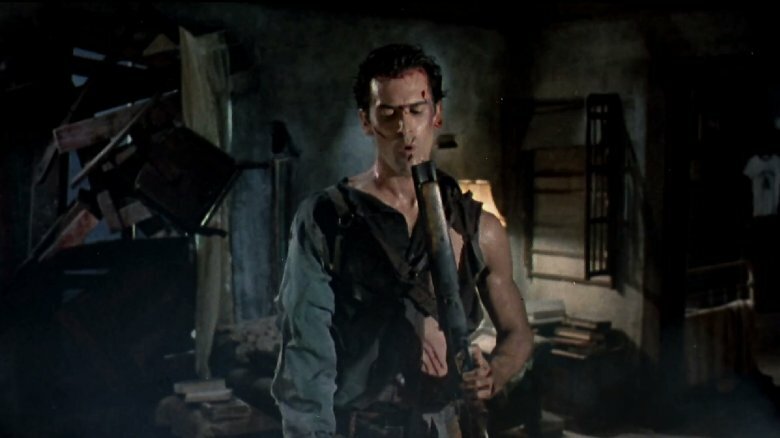 According to Bruce Campbell, the crew originally wanted to do Army of Darkness as the second Evil Dead, but "it seemed too expensive at the time, and so it took a few more years for that to gestate into being possible." In the five years between the modestly-budgeted Evil Dead II and Army of Darkness, Sam Raimi filmed his first major studio movie, Darkman, which was successful enough to get him funding from Universal to bring the second sequel's $11 million production to life. Irvin Shapiro once again decided on the title of the movie; Sam Raimi and company, meanwhile, wanted to call it The Medieval Dead. This was not the only creative difference that would crop up during the movie's long road to a theatrical release. In the midst of an unrelated dispute between Universal and an Army of Darkness producer, the film sat on the shelf for a year. Afterward, when the studio started looking through the footage, the decision was made to recut the movie. According to editor Bob Murawski, "They didn't really understand it, they thought it was too long, and didn't respond to a lot of the funnier stuff." Fifteen minutes were cut for the sake of removing gore and preventing the movie from being such a downer. The differences resulted in an altered opening and ending, with important story scenes cut out entirely. The ending in particular was a point of contention, with the studio wanting something more optimistic. One intended ending was completely nihilistic, with Ash dying in the back seat of his car while on his way back from the past. Another ending, with Bruce accidentally waking up in a post-apocalyptic future, could have been the setup for an inspired sequel, but was axed for being too sad. "We thought, 'That's perfect!'" Bruce Campbell said. "Because the lead-in to the next movie is Ash leads a team of robots against the Deadites. He's Omega Man. It would be fantastic. 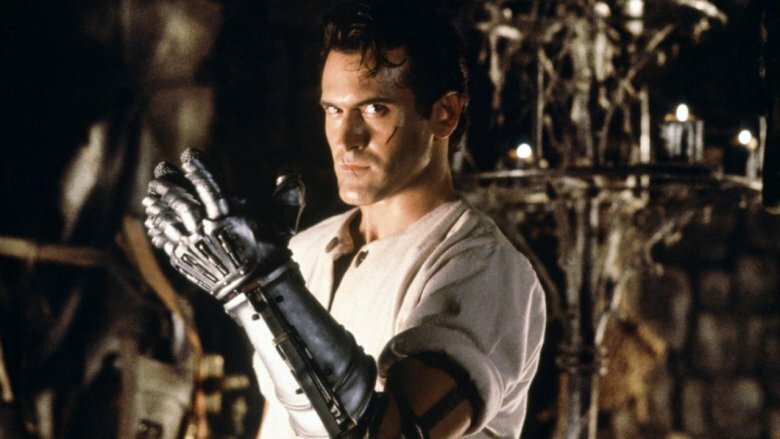 Army of Darkness 4 would be great—Ash leading an uprising of robots against Deadites. We thought that was way better." 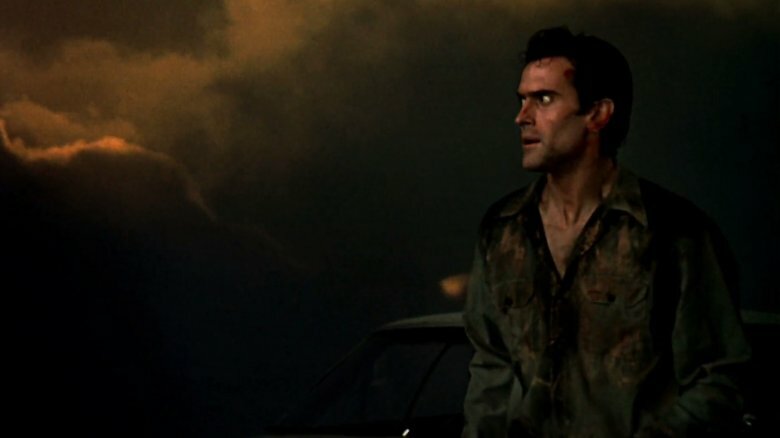 Test audiences disagreed, which resulted in a new ending sequence in the present-day S-Mart, with Ash the hero surviving his journey home, capping it off by blowing away a Deadite. 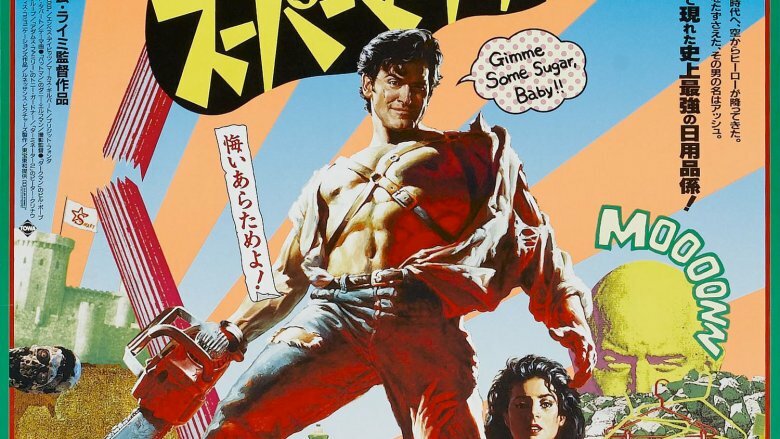 Although the budget for Army of Darkness was well above what the franchise had seen previously, there was still a lot of suffering on the set—much of it intentional. Sam Raimi again made a hobby out of torturing Campbell during production, making him train for a dance sequence that was never filmed, and for close-up shots of Ash being smacked in the head with a book, Raimi swung the book—and swung hard. 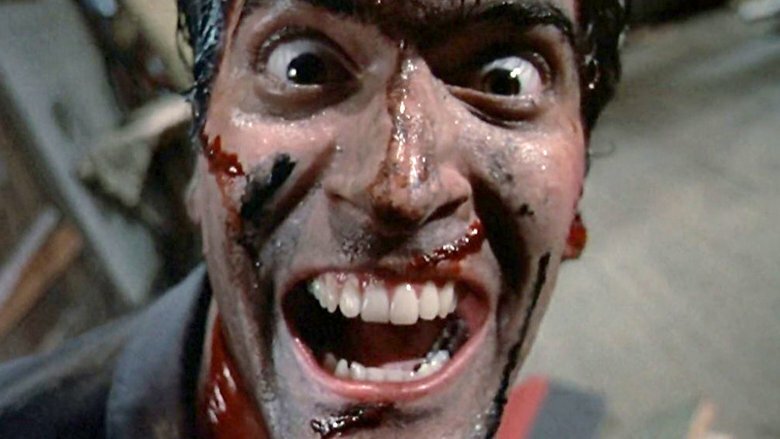 Following the release of Army of Darkness, the Evil Dead franchise went dormant. After all the pre-release struggles, reshoots, and edits, the movie ultimately was a financial disappointment, failing to recoup its budget during its theatrical run. 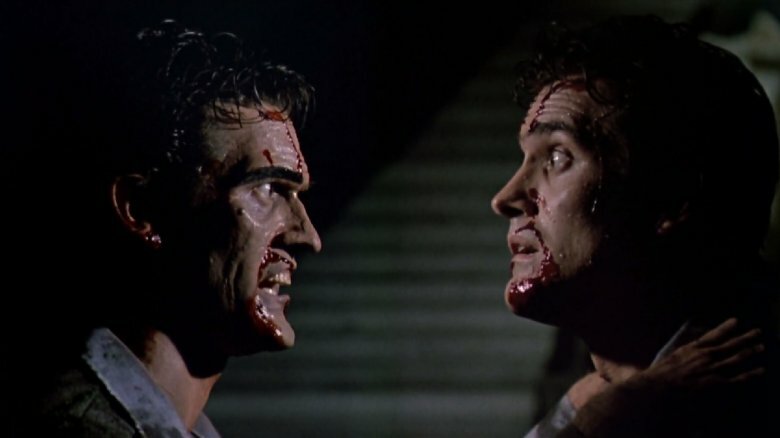 During the years that followed, several ideas were floated for a potential fourth installment in the series, with one idea being to make the two different endings to Army of Darkness canonical, pitting an Ash who made it home against an Ash who continued his adventures in the far-off, apocalyptic future. This idea was scrapped for being too confusing, but avid fans calling for a fourth movie only grew louder. "I would make a Spider-Man movie and they'd say, 'That's fine, but can you please make Evil Dead 4?'" said Raimi. "They didn't care [...] I said to Bruce and Rob, 'Let's remake Evil Dead with Fede Alvarez, my friend. He's super-talented and that will finally give the fans what they want.'" But fans still gnashed their teeth at the concept of a remake, to the extent that the original trio had to emphasize their involvement. 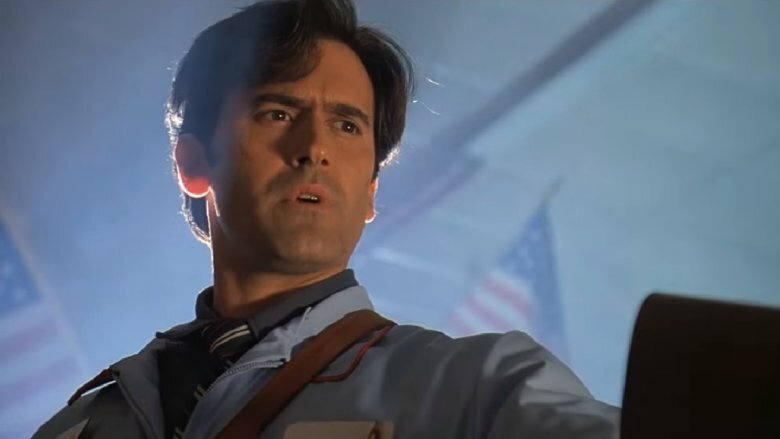 "We're all over this project," Bruce Campbell said, sating fans in the lead-up to the movie's release. "Rob Tapert was there producing every day on set, Sam has been there all along, I was involved in casting very heavily because we want to get good actors who know what they're in for." Though fans and critics both were mostly pleased with the remake, there was still one thing everyone wanted: more Ash. "[Fans] really loved his movie," Raimi said of Alvarez's feature. "And I loved it. But afterwards, I still heard that, 'Now we want your Evil Dead with Bruce in addition to Fede's movie.' So I went, 'Oh my God. There's no quieting them. Why am I running from it anyway?' I mean, maybe it was out of fear a little bit. They seemed to like these movies and I didn't want to make one that they didn't like. I didn't know if I had much to gain, but they were so insistent we finally said, 'All right, let's just do it.'" Along with his brother Ivan, Raimi finally began work on another, Ash-centric Evil Dead, eventually landing on the idea to do a TV show. It was a natural fit, with the Evil Dead crew having worked extensively in TV, producing the fantasy show Hercules: The Legendary Journeys. 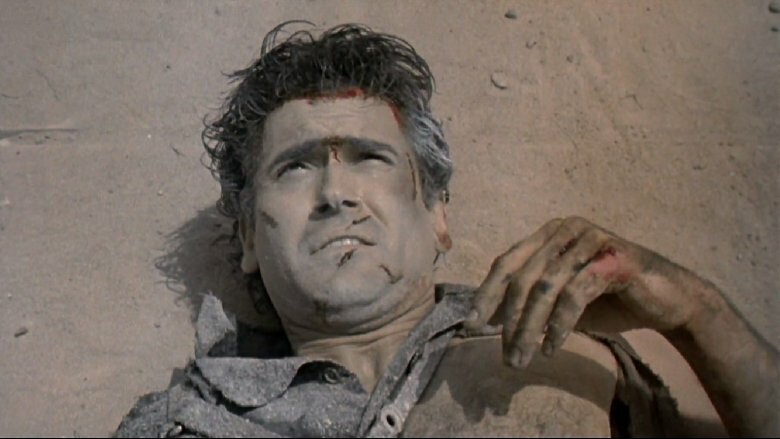 "Rob Tapert's done a lot of TV, produced with Sam a lot of TV, I've done a lot of TV—let's try TV," Bruce Campbell said. "We had three different suitors who were going to do this show as a series. And we picked the one, Starz, that we felt could give us the same creative freedom we had on the first one. So we had a lot of creative freedom, and we have no content restrictions basically whatsoever." Since it debuted in 2015, Ash vs. Evil Dead has been a hit with both audiences and critics. In a lot of ways, there's never been a better time to be a fan of Evil Dead—but what's next for the franchise? 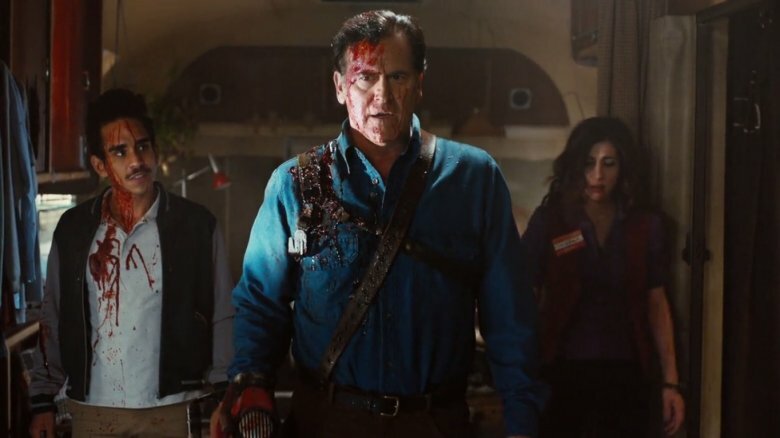 In the wake of Alvarez's Evil Dead, there was some talk about doing a crossover movie that would collide the remake and original universes, bringing Ash into the orbit of the remake's characters. Plans for such a project are on hold, even as Campbell continues to contend that it's "entirely possible." And it's true—when it comes to this enduring horror show, the sky's the limit. To think that such a little film, originating out of the deep woods of middle America through sheer force of will, would continue to have such an impact is nothing short of remarkable—or as Ash would put it, "Groovy."